So, two nights ago I was perusing Food Network online for a new chicken dish to try. The Food Network is one of my favorite channels and I have used lots of recipes from different shows. I tend to use a lot of Paula Deen, Giada de Laurentiis (Everyday Italian), and Down Home With the Neelys recipes. Well this time I chose a recipe by Ina Garton of Barefoot Contessa. I chose it because I'm a lover of all ethnic food, and this chicken recipe was right up my alley. I decided to also make the two side dishes she'd made with this dish. So here are the recipes. 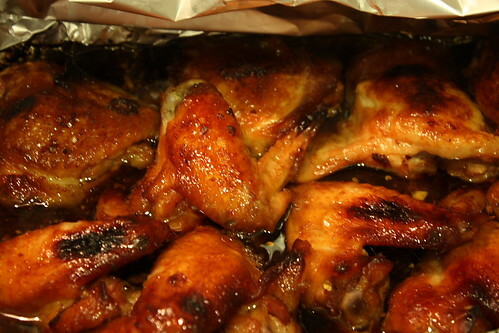 - Instead of chicken quarters, I used wings and thighs (skin on). In the future, other than the wings, any other chicken parts that I use, I will make sure they are SKINLESS. Even marinating as long as it did, the skin seemed to get all the flavor. 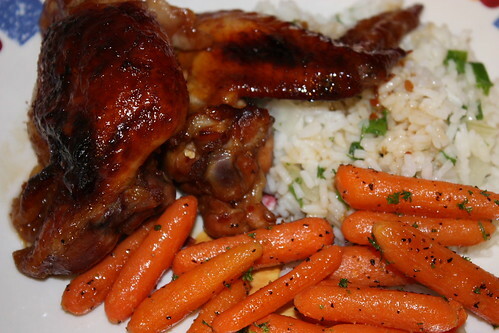 Because I don't usually eat the skin on chicken (except on wings), I'd rather the meat get all the good flavors. Also, I added some red pepper flakes to the marinade to give it a little kick. 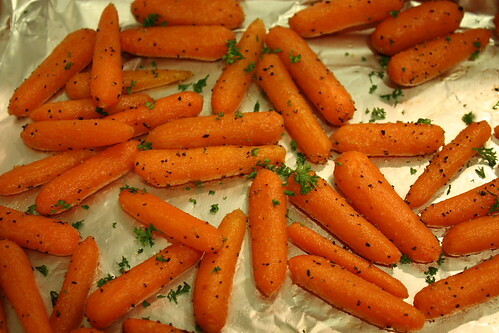 -As you can see, instead of going through all of the trouble of peeling and slicing carrots, I used baby carrots. -The rice I used wasn't basmati. I used what I'd already had in the cupboard, which was instant rice. It still came out PERFECT, and was actually a surprise highlight of the meal! 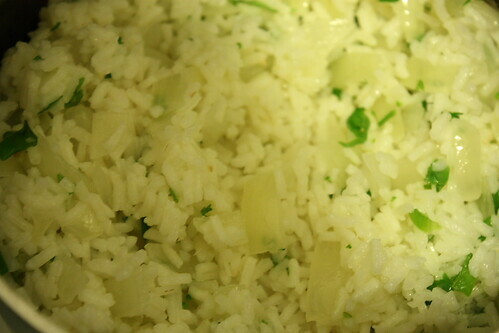 -Put your fresh ginger in the freezer--it makes it easier to grate later! -Lastly, where she uses kosher salt--I'd used sea salt, again, what I'd already had in the cupboard. This will definitely be added to the repertoire! OMG...this looks SO good!! I will have to try it out. This looks delicious! I will have to try the entire dinner out soon.